Anniversary celebrations, by their very nature, encourage us to be reflective. Historical milestones give us pause to think about the many friends, mentors, and colleagues we met along our journey through our years at Roeper. Through the many events and activities we have planned for this year we hope to reconnect you to those relationships. We also hope to inspire you to think about our next 75 years, to collaborate with us as we hold true to the philosophy and values of our School, and at the same time inspire our community to think deeply and thoughtfully about what it means to be a Roeperian today and what it will mean for generations to come. I invite you to join your friends, colleagues, and classmates in celebrating the enduring legacy of George and Annemarie Roeper. Whether you attend our Alumni Reunion, join us at our Gala Celebration, share your story in our online anthology, or stop by to re-connect with faculty and friends on campus, we want you to be part of this incredible moment in history. I can’t wait to welcome you home! THANK YOU! Your generosity propelled us to the highest net profit for a Roeper Auction in the last ten years! We raised more than $150,000 toward the Mariann Hoag Financial Aid Grant Award Program and Professional Development for Faculty and Staff. We offer heartfelt gratitude to Auction Chair Beth Vens, for her tireless commitment to the community, and to Katie Buchmann, Development Officer, for her expert guidance. Most especially, we depend on the inimitable creativity of our students, faculty and staff; the remarkable support of our steering committee; our corporate sponsors; and the generosity of our bidders and donors. Your investment in current and future Roeperians ensures an even brighter future as we imagine and prepare for the next 75 years and more! The Classes of 2004 and 2006 held mini-reunions this winter, just to whet everyone’s appetite for the big all-class reunion this coming Memorial Day weekend. Check out a few photos from the reunions in the Galleries. Join us for a weekend of fun and excitement May 25-28 as we welcome you back home to celebrate Roeper’s 75th Anniversary! The weekend’s events will give you a chance to look at the many components of the continuance of life at The Roeper School. By coming home, it gives us time to think back to our school days and relive the history that George and Annemarie so richly embedded in our culture here at Roeper. Bring your significant other, bring your kids, and come for the entire weekend, or attend as many activities as you can! More details are available under the Alumni tab at the top of the page. Registration opens soon! Is your collection of Roeper wearables a little threadbare? Do you lack the right toy to share your Roeper love with your kids? Welcome to the 75th Anniversary Gift Shop. 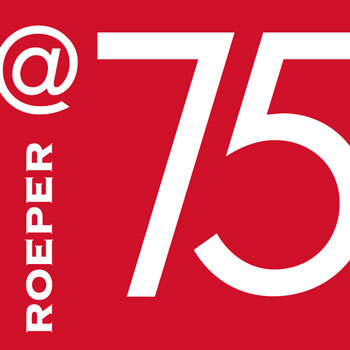 Here you can find a wide selection of apparel and accessories in celebration of the last 75 years of The Roeper School. From T-shirts to baseball caps, puzzles to a one-of-a-kind souvenir of the Birmingham Six Square court, the gift shop offers memorable items for everyone. The mission of the My Roeper Story project is to bring together and honor the stories of the students, faculty, and staff from over the years who have been a part of the vibrant culture of The Roeper School. This project is a visual testament to our diverse community that will far outlast its origins as a 75th Anniversary retrospective. We want to continue to collect your Roeper stories, so please e-mail alumni@roeper.org for further information on how to submit your own story.